My Christmas Spirit had deserted me. I had no Happy Holiday anticipation. This is my favorite time of year. I start planning in autumn, and start preparing the 1st of December. But I have no oven to bake Christmas Cookies. Or my traditional Christmas Pumpkin and Cranberry breads. Of course, I didn't have a garden this year to grow the pumpkin in the first place, and even if I had, no freezer to store it it. And there's been no sign of fresh cranberries anywhere around here. I can't put up a Christmas Tree. It's too cold in Vlad's House to put it in the living room and not enough room in the kitchen…. On principle, 'cause I'm being pissy, I have steadfastly refused to go searching for any Christmas candles or other holiday decorations. They'd just get full of soot and smoke. I wanted to be in OUR house by Christmas. Instead we are stuck in Vlad's House and I refuse to decorate it. He's not much for Christian holidays, anyway… Probably get right out of his coffin at the first sign of a star. But, have I complained? Expressed these feelings out loud? What? And ruin my perfected martyr's stoic demeanor? Chin up; stiff upper lip and all that? My, ahem, good behavior has been rewarded. Mon mari suggested we take a day or two, relax and drive south in search of warmth and sunshine, maybe find a Christmas market to visit. We really shouldn't take the time, there's so much to do. We really shouldn't spend the money, it's disappearing rather rapidly into this monstrosity. But, really, what's the point of living here if we don't, well, live? Two days isn't going to make a big difference in our restoration, in the long run. Neither, we decided, will three more. Our friend, from the mountains in Spain, just invited us to spend Christmas with him. We helped restore his house 10 years ago. Two days in Avignon; Christmas in the mountains. My Christmas Spirit has been restored in full measure. I may even track done some cranberries…. This is a colorful dish full of: capers, olives, peppers and garlic, made like a stir-fry, leaving the vegetables with a bit of crunch. Roughly chop onion and pepper. Mince garlic. Cut broccoli into bite size florets and stems. Heat oil in medium nonstick skillet. Add onions, pepper, broccoli, and sauté 5 minutes. Add garlic and sauté another 2 minutes. 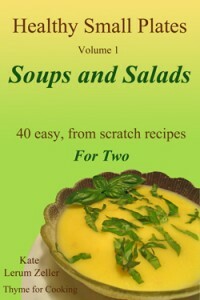 Remove vegetables to a bowl or platter and cover. Add chicken to skillet and sauté 6 – 8 minutes per side, or until done. Pit olives if needed and cut in half. 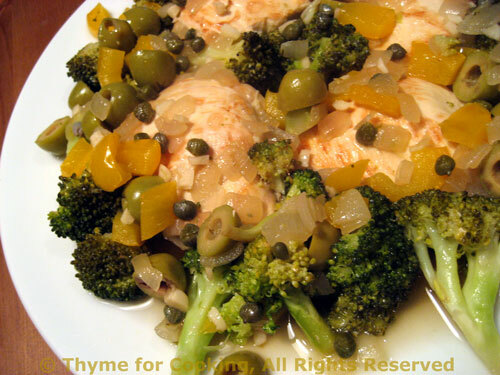 Return vegetables to skillet, add olives, capers, marjoram and wine or stock/lemon juice. Stir to combine. Cover, reduce heat to low and simmer another 7 – 8 minutes to blend flavors. Arrange attractively on a small platter and serve. Don't you just love the holidays?!?!? Katie, that looks great… I used make chicken with sundried tomatoes and olives, and plenty of garlic… Adding broccoli to chicken dish sounds really good. I just wish it weren’t such a busy time at work for me. I’m glad you got some Christmas cheer going! You have a wise husband to think that way. You have been a good girl getting through this far with all the french housing business! I wish you a great holiday seaon and a lovely stay in both Avignon and Spain!!! Yay! You got your Christmas Spirit back! It will all be worth it when you’re in. You could start planning next Christmas now… More pics when you’re ready please. I love renovations. Life is for living not just working and when it’s done 5 days or 10 won’t be noticed. Have a grand time! Love the chicken and broccoli! I am so glad your Christmas spirit has returned. What I wouldn’t give to be spending Christmas in the south of France…the Riviera comes to mind. Thanks, Margot, olives and garlic are always a good! Betty, me too, Too bad your so busy! Vacation time is coming tho, right? Thanks, Lien, I have to go dig out some warmer clothes for the mountains. Amanda, more pics tomorrow, today got away from me… as usual. Tanna, I keep trying ti remember that! That sounds wonderful, rivrpath! Dec. 21 is actually, my favorite day of the year! I need to buy some candles…. Val, the Riviera would be lovely… but we won’t make it quite that far! Looks delicious and a great combo of ingredients to use together!